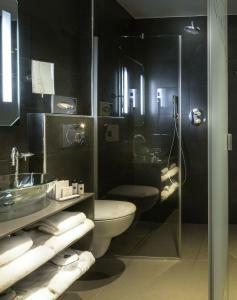 Located in the heart of Paris, Lyric Hôtel Paris is a design hotel just 450 metres from the Opera Garnier. Guests will have free access to the hammam, sauna and the indoor swimming pool, and there is also a fitness room. All of rooms at Lyric Hôtel Paris have music-inspired décor, a flat-screen TV with cable channels and a wardrobe. 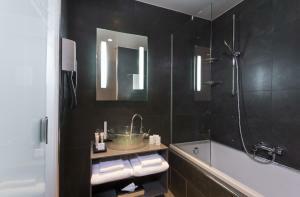 The bathroom is fitted with a bath or a shower, free toiletries and a hairdryer. Other facilities include a 24-hour reception, free Wi-Fi access and a wellness centre. The hotel is ideally located 80 metres from Quatre Septembre Metro Station (Line 3) and a 10-minute walk from Opera Metro Station. This twin/double room features a bathrobe, minibar and flat-screen TV. Rate: € 159.00 ... € 362.00; select dates below to get current rates. This suite features air conditioning, bathrobe and satellite TV. Accessible from the entrance hall, this double room has a satellite TV, minibar and air conditioning. This room is composed of 2 adjacent double rooms. It features a flat-screen TV, air conditioning and minibar. Rate: € 217.33 ... € 279.50; select dates below to get current rates.